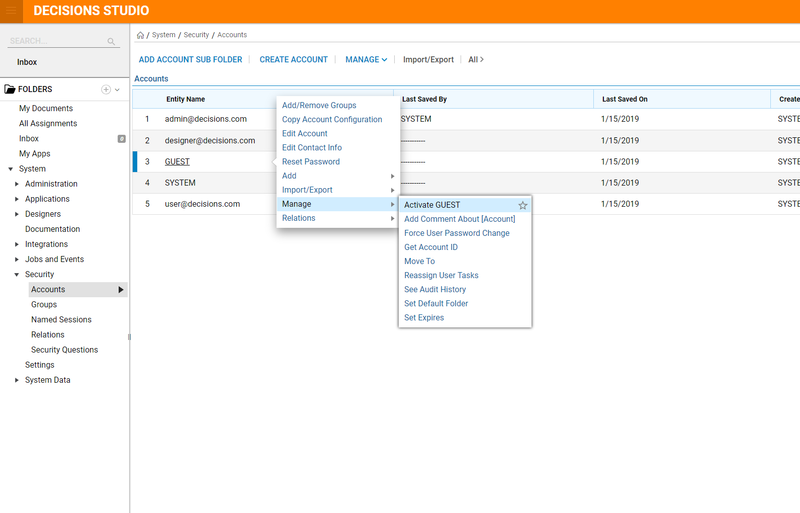 A Guest account is an optional user account that can be used to get non-portal users, such as an outside vendor for example, to engage in a flow. The guest account user is enabled under System >	Settings > Portal Settings	, by checking the Enable Guest Account	checkbox found under Portal Settings	. When the Guest account is active, you will see a GUEST user in the user's list and forms will have the "Assign to Guest" option available for doing assignment. To use a guest account it has to be activated, enabled and then given portal access. To activate the account navigate to account > manage >	Activate Guest Account. To give the Guest account portal access, go to Security> Accounts	. Select the guest account and choose Edit. Within the Edit Entity dialog, select Is Active	, Is Confirmed	, and Can Use Portal. To enable the Guest account, go to System > Settings > Portal Settings	. Under Portal Settings	, check the Enable Guest Account	checkbox.